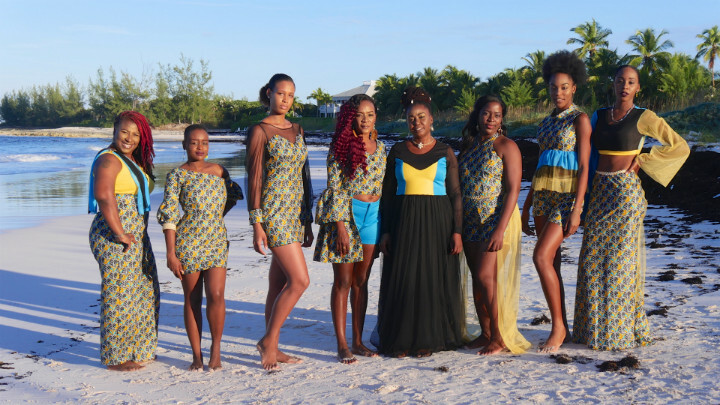 A clothing designer living in Eleuthera is calling for Bahamian jewellery, handbag, hat and footwear artists to collaborate with her to provide a "complete Bahamian fashion experience" for locals and tourists alike. Verda Gardiner, better known as Empress Verda, has been sewing for nearly 30 years. She loves using Bahamian colours and African fabrics but in recent years, she began looking for an authentically Bahamian fabric that is similar in appearance to the African fabrics she loves so much. She expressed this desire to a friend of hers at the One Eleuthera Foundation, of which she is a part, and they gave her the contacts for Danielle Morley, a local fabric designer living in Exuma. Although Empress Verda and Danielle never met in person, they struck up a digital relationship that blossomed into Empress' latest line of clothing. They have been networking for nearly a year now. Danielle produced her first fabric design and then a second, the latter being the one that Empress said "really got her design juices flowing'. "The fabric, which Danielle called Bahamiana Seagrape, was closest to what I was looking for in terms of a totally Bahamian fabric with similarity to African print," Empress Verda said. She launched her new line of designs using the Bahamiana fabric this past weekend at the Ministry of Tourism's Arts, Craft and Farmer's show in Eleuthera and the line was also featured on Tourism Today. She was able to score a few accessories from local craftsmen for her models to wear with her designs, but she wants to take it to another level. "The tourists really like it - it's what they are looking for," she said. "But I want to take it further, I want to showcase my designs in the hotels and I want to team up with Bahamian footwear designers, jewellery designers who will create pieces for my styles, and handbags made to compliment the outfit and bring it all together. It's important for local designers to collaborate." She started making clothes when she was a teenager and took it on as a profession in her early 20s. She attended BTVI and then took up private sewing classes. "The very first outfit I made was a red and white polka dot dress with a drop waist, which was very popular back in those days," she shared. "I made it for an elderly lady in my neighbourhood. When I saw her walking down the street wearing it, I was very proud. It wasn't perfect, but I was proud and I never stopped sewing." Today, the Cupid's Cay resident enjoys passing on her knowledge to the younger generation. She teaches after school sewing classes at Central Eleuthera High School. When asked if she felt that the sewing profession could survive with so many people buying on line or in clothing stores, Empress Verda pointed out that "there will always be those women who want to wear something no one else is wearing and they want a prefect fit". She added that those buying in stores or on line still come to seamstresses and tailors for alterations.